Wow! It's incredible! Cause in this game you are going to control a huge truck and collect a lot of coins during the way and be sure that you will be not disappointed. Just drive your huge truck and try to become the real professional. Enjoy it! Are you a good driver? Well, we wanna to see that! 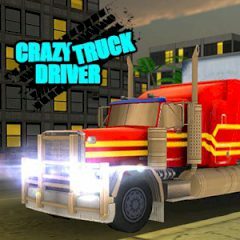 In this amazing Crazy Truck Driver game you are going to drive a trailer truck which is chased by the police. Could you believe that? Well, sometimes it will be not so easy. That is why do not forget to collect all the coins so you can unlock different trucks and environment. Try not to make a crash and be sure that you will really love the game. So, have faith in yourself and drive like a real professional. We know that you can do that. Use the arrow keys to move and you will have so much fun here.